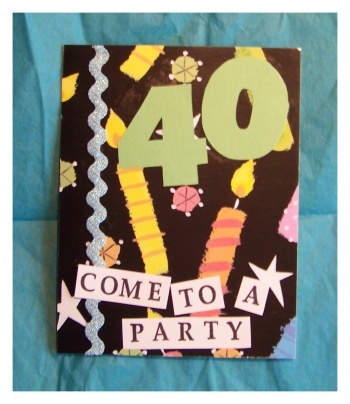 These 40th birthday invitations are constructed using card stock as the base of the card. To create these cards you will cut the card stock in half leaving you with two pieces of paper. You will then fold these pieces in half to create a card. You will make two cards from a single piece of card stock. 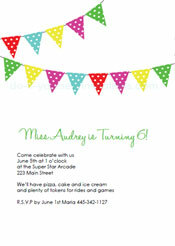 The first step to take in making these invitations is to get the invitation wording printed onto your card stock. If you are going to create your own custom wording then it may be easiest for you to cut the card stock in half first, and then print your wording onto it. You can also choose to use our printable text templates to print onto your card stock 2-up. These templates are designed to be printed onto your card stock before you cut it. A word about cutting the paper - You can easily cut the paper yourself using a good paper cutter if you want to save money. Another great way to ease the work load is to bring the paper to a local print or copy shop. They will not only copy the invitation wording onto the paper for you, but they will also cut the paper for you. These kind of shops usually have a hydraulic paper cutter designed for cutting many sheets at once. It is cheap, and super easy. 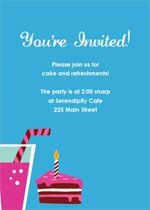 After you have printed onto all of your card stock, and have it cut in half as well, the next task is to fold all of the card stock in half to create the base of the invitation. Now on to the decorating! Start by adding some decorative paper to the front of the invitations. Cut your chosen paper into rectangles to fit onto the front of the card. (Pssst. Can also cut these by hand or bring em' to the copy shop along with everything else.). This paper should be cut to measure 4 1/4" by 5 1/2". Use a permanent adhesive glue runner to attach the paper to the card. You do not need to cover the back of the paper in glue to make it stick. Just on the edges and a couple dabs to the middle. Cut the rick rack into lengths of about 6" each. Use the glue runner to attach these to the front of the 40th birthday invitations as well. Again, you really do not need to cover the entire thing in glue. Just the ends and the middle should be fine. Attach the rick rack to the invitation so that it hangs off the edge a little on each side. After it has stuck go back and trim the edges. To create the "Come to a party" lettering I used rubber stamp letters. If you do not have letter stamps, or just want to make the project a little easier, just print the lettering off of your computer. I just happen to enjoy using stamps. Create the lettering on plain white paper (whatever you have - I used index cards just because they happen to be sitting there). Cut each word out into a bock. Use a glue runner to apply glue to the back of each and arrange the lettering onto the front of the invitations. I like to stick each word a little crooked from each other. Try to overlap the rick rack a little too. Now on to the big 4 0. I actually used a paint program to create the numbers in a font and size that I liked, printed them onto some colored card stock, and then cut them out using the printed numbers as a guideline. If you do not have a paint program you can download Paint.net for free. That is the program I used to create the numbers. Open the program and select image> canvas size. When the window opens set the canvas to 850 width and 1100 height. Next choose the letter tool and type in the numbers. Select a font that you like, preferably one that has some meat to it so it is easy to cut from the paper. Select the text size as 144 . Now select image > flip horizontal. Lastly, to save on printer ink select adjustments > brightness & contrast and turn the brightness up and the contrast down to make the letters a light gray color. Print the numbers onto a colored paper of your choice. Use an Xacto cutting blade to cut the letters out of the paper. Once the numbers are cut from the paper you can use a glue stick or glue runner to apply some adhesive to the back of the numbers and attach them to the front of the 40th birthday invitations.